Any concert which promises an American premiere of a György Kurtág work is worthy of attendance. But knowing that Joel Sachs and the New Juilliard Ensemble are the performers adds another value to the evening. That word “New” is a paradox. The New Juilliard Ensemble has been going for almost a quarter century, so it is hardly a wunderkind. On the other hand, the performers are indeed new. 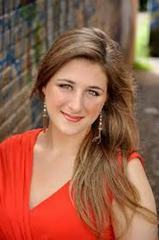 They are the students of Juilliard itself who audition yearly for membership. And even acceptance doesn't mean that they will be playing. Like any varsity team, the 100-odd musicians might be sitting on the bench while the chamber works utilize perhaps seven or eight of their kin. So is that worth the audition? Well, besides the 100-odd world- and American-premieres, the group travels like any professional group to festivals and museums. And with that arch traveler Joel Sachs—whose musical studies have taken from to Iran, Mongolia and all points in between—they have a very singular leader. Singularity was the center of the five works played last night, from the United Kingdom, China, Hungary and the United States. They were all new, thus all challenging (both to musicians and audience), and Mr. Sachs led them as though they were classics in the making. Their sole commonality, in fact, was that each chamber work had very unusual combinations of instruments, so that even in the most abstruse work, the colors and timbres were fascinating. Nothing was abstruse about the final work, From “A Book of Hours” by James Primosch. In fact, it was both the most substantial and the most romantically stunning of the evening. What Mr. Primosch accomplished was to use a tonal musical language which still projected a sense of modernity. The piece could have been a mirror-image of a Mahler song-cycle, albeit with modern lines and harmonies. Yet why not? Why not use the finest orchestral song-writer in history as your model? And adding your own language? Because the effect was simply gorgeous. An equally beautiful short work was by British composer Michael Zev Gordon, whose Sehnsucht (“Yearning” or “longing”) was exactly what the title signified. The ensemble was made for coloration: viola, cello, flute/piccolo, clarinet/bass clarinet and piano, with Jake Darnell playing a most unusual vibraphone. We had here a work of moderate tempo, ending very slowly. The instruments initially rolled over minor-seconds in harmony, which, yes, would signify a yearning. But that itself rolled into (what seemed to be) microtones, each string or wind or piano chord both “being” and “becoming”. Mr. Darnell's vibraphone was effective enough. But towards the end, he picked up a double-bass bow, rubbing against the sides of the keys, providing a deeply felt, even evocative resonance. Kurtág's Brefs Messages were typically aphoristic pieces with duets for brass, strings and winds, probably with hints towards J.S. Bach. They were puzzling, intriguing, and I felt that the secret to enjoying Kurtág is to play Bach before and after (as he does in his concerts). The 350-year-difference is like a faraway wave in a large pool, yet one senses the starting 18th Century figuration. Elliott Sharp's Wannsee Noir was based on lake near Berlin, a place with birds and twilight beauties...and a conference hall wherein the Nazi meeting sealed the fate of Jews, Gypsies etc in 1942. Thus the “noir”. How to approach this? Mr. Sharp started with an obvious homage to Messiaen's own bird music (not squawks or chirps themselves, but instruments in concord), then going into several movements which were like disjointed dances—the essence of polkas and waltzes, without the rhythms—and with incredible trumpet riffs by Matthew Mead, whose instrument frequently resembled a military bugle. Still unsure of the intents of Wansee Noir, so I left it to his personal imagination. The opening work was by that eclectic Shanghai-born performance artist, composer/director/improviser (instruments both Eastern and Western), Du Yun. Ms. Du's Quatrain consisted of beautifully framed movements, with a very unique coloration. 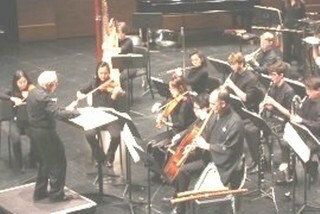 Perhaps in honor of the Chinese zheng, she put together harp (Emily Melendes) and guitar (Adam Cockerham), with the violin, cello, oboe, horn and percussion. The combination of these two most unlike strings produced radiant sounds, both chordal and linear. I had never heard guitar and harp in combination before, but even in a work which displays only one part of Ms. Du's personality, these were colors that invite a concerto written for such rare duo. It goes without saying that Mr. Sachs and his young artists apparently (since they were all new) produced all the techniques and joys necessary for another involving evening.